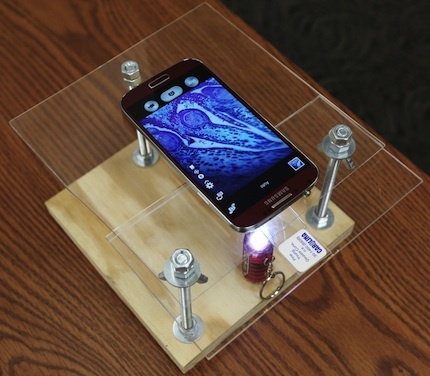 Take a smartphone, add $10 worth of plywood and Plexiglas, a bit of hardware, laser pointer lenses and LED click lights from a keychain flashlight and you have a DIY microscope worthy of use in college classes. At least, that's the idea of an instructor at the Missouri University of Science and Technology who is adding the do-it-yourself technology in her biology lab courses. The project is part of a larger research endeavor at the university to explore the design of instructional labs for science and engineering courses that can be delivered in a blended or online format. The goal of a research is to develop e-learning models to redesign traditional lab courses to work in a hybrid format and to create a handbook for use by instructors that explains how to apply the new models. "We're working with different lab courses on campus that use blended or online learning and plan to come up with an instructional model that could be reproduced anywhere," said Manager of Educational Technology Angela Hammons. Courses that are part of the pilot include a general chemistry and biology labs, an introductory physics lab, a microbiology lab, a mechanics and materials lab in civil engineering and labs in nuclear engineering. Participating faculty intend to develop their own learning kits for use in the lab or outside of the lecture hall. For example, the microscopes were designed during the spring semester by Daniel Miller, a graduate student in biological science who served as a teaching assistant in the biology class taught by Associate Teaching Professor Terry Wilson, where the scopes were used. Wilson had been hunting for a commercial kit, but she wasn't happy with what she was finding. Then Miller showed her his own prototype: "I was blown away by it," she recalled. "I was really shocked by how good a job it does." The devices are impressive. They can magnify samples up to 175 times with a single laser pointer lens — nearly 400 times when stacking two lenses, Miller said. During the initial use of the scopes, Miller offered extra credit to students would built their own; out of 50 in the class, 15 took up the challenge. "They love it," he said. "They get to take it home and can use it to look at specimens whenever they want." To simplify the process of finding the components for students in the fall class, Wilson will make kits available for purchase in the bookstore. She will also provide six of the microscope stands for use in the instructional lab. Her students in the biology class who undertake the job of building their own digital microscopes will earn extra credit. But the scopes themselves are just one aspect of a larger experiment in "flipping" portions of science classes that include lecture and lab work. For example, Wilson plans to flip the lecture portion of a cell biology course as part of a "Transforming Instructional Labs" project. That will cut face-to-face time down to two hours from three. Students will need to study course content outside of class by recorded video lectures or other resources. "What we've found is that while there is a lot of discussion about flipping the classroom in higher education, there aren't many places doing much in terms of flipping instructional labs, especially in STEM," Hammons noted, adding that the outcomes from flipped labs will be compared to traditional labs as part of a pilot. The work is being funded by a grant from the University of Missouri System. Similar projects are underway, according to the researchers, at Michigan Tech's Jackson Center for Teaching and Learning, Virginia Tech and other institutions.